Lefteris Michailidis received the 2013 Distinguished Dissertation Award for his work to understand EFdA, a new drug that shows promise to treat resistant HIV viruses with fewer side effects. A four-letter drug could be the next generation of AIDS treatment. EFdA, a new anti-viral drug in development, promises HIV treatment that is more effective with fewer side effects and less resistance. 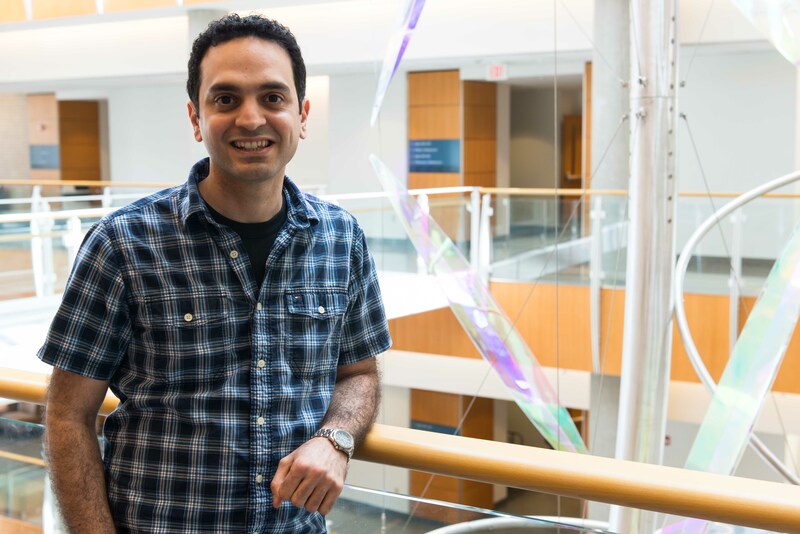 Lefteris Michailidis received the 2013 Distinguished Dissertation Award earlier this year from the MU’s Graduate Faculty Senate for his work to understand how EFdA works on a molecular level. Michailidis currently works as a post-doc in Stefan Sarafianos’ lab. Sarafianos is an MU associate professor of Molecular Microbiology and Immunology and a Bond Life Sciences Center investigator. A month after Michailidis defended his dissertation in 2012, the drug company Merck licensed EFdA and it is currently in preclinical trials. Collaboration made this progress possible. EFdA was discovered in 2001 by Japanese researchers at Yamasa Corporation, a soy sauce producing Japanese company. Sarafianos’ lab at the Bond Life Sciences Center cooperated with them and Michael Parniak at the University of Pittsburgh to explore the drug. Michailidis looked at the structure of EFdA, comparing the way it works to widely used anti-HIV drugs. These current drugs, called Nucleoside Reverse Transcriptase Inhibitors (NRTIs), are used as one of the first therapies in AIDS treatment. They target reverse transcriptase (RT), an enzyme that starts viral replication. By competing with natural nucleotides, NRTIs can terminate DNA synthesis, stopping the spread of the virus. Michailidis found that EFdA ‘s structure includes a hydroxyl group that is missing from current NRTIs like tenofovir, the most prescribed HIV drug. This difference makes EFdA effective against resistant, mutated HIV strains where traditional classes of HIV drugs fail. AIDS was first reported in 1981, and its diagnosis was equivalent to a death sentence. Since the first NRTI drug was approved in 1987, HIV has progressed to more of a manageable, chronic disease in the developed world. The World Health Organization estimated in 2011 that 34 million people live with HIV, with 1.4 million of those living in North America. Michailidis hopes his research will help lead to future drugs on the market that will counter HIV resistance and improve the lives of patients.